Yes, boy dogs wear bows too! in all sorts of styles and colors. 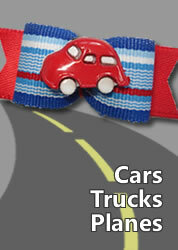 Great bows that your little guy will be proud to wear! CARS/TRUCKS/PLANES Here you'll find lots of mighty machines! From dump truck dog bows and bulldozer dog bows to tugboat dog bows and train dog bows, and from jet plane dog bows to helicopter dog bows to great car dog bows. Fun boy dog bows! CAMOUFLAGE Camouflage patterned dog bows in a variety of great new styles. all here. 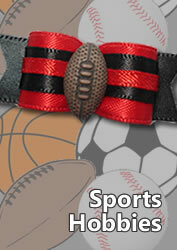 Custom team sports dog bows available. If you need specific team colors not shown here, feel free to contact me. I can likely create it for you! 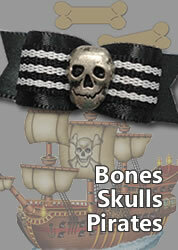 BONES/SKULLS/PIRATES From dog bows with sparkly bones to dog bows with cool bones and from dog bows with skulls to dog bows with skulls on ribbons to unique & fantastic dog bows with pirate hats! A fun category of dog bows! PLAID DOG BOWS All sorts of plaid dog bows - from manly black & white plaid to handsome Burberry-style dog bows, blue plaid dog bows, black plaid dog bows... well, you get the idea! A large variety of plaid boy dog bows in assorted colors and styles. WESTERN | COUNTRY DOG BOWS - country bows, western bows, cowboy (and cowgirl) bows full of country plaids, hats, boots, horses, lucky horseshoes and more! NAUTICAL DOG BOWS - bows with sailboats, pirate hats and more - ahoy sailor! 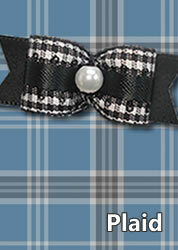 DESIGNER PLAID |"BURBERRY-STYLE" DOG BOWS - fantastic bows created from classic & gorgeous tartan ribbons imported from Europe. PAW PRINT DOG BOWS - sweet bows covered in cute little puppy paws in many boy-friendly colors. CUSTOM DOG BOWS - can't find exactly what your little guy needs? I'm happy to create a custom bow perfectly suited to him. HELPFUL TIP: Links above are just a few options to get you started. Check out the left menu bar for many more choices!